The session to shoot green tea in a cup and saucer was a great experience when I demonstrated shooting food in the studio for our BTEC level 5 learners. We visualized the tea in a transparent cup placed on the saucer. We thought it would be better to show a piece of cut lemon and mint leaves as supporting elements. It was a high key feel we wanted to achieve. Everything went on well and we started with a transparent base and back lighting to show green tea to be appetizing. The tea was diluted enough to show the transparency. 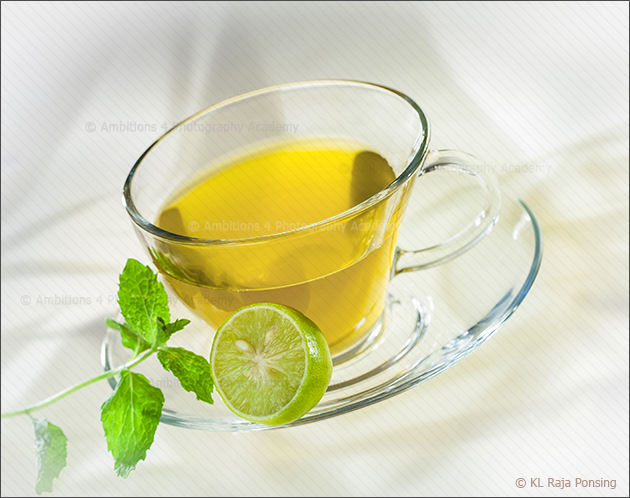 The first test shot showed the lemon and mint really dark and non-appetizing. 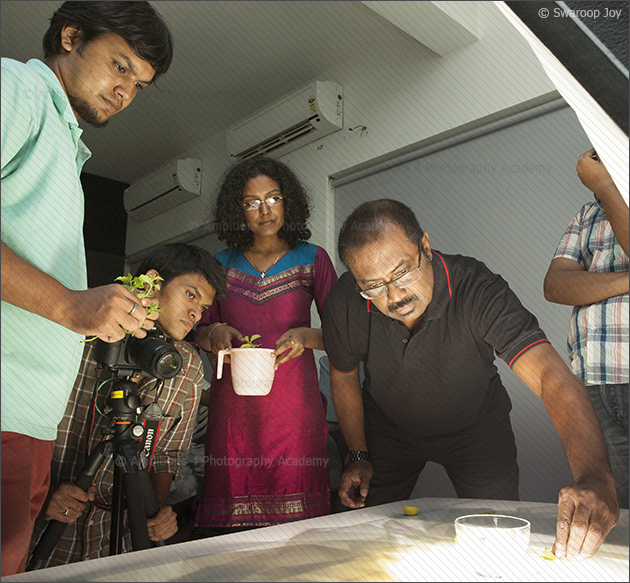 We then planned for a narrow light source using a 10-degree grid from the sides to fall on the lemon and mint leaves. Another narrow light source was placed from behind the mint leaves to show its texture and glow. All the three lights were moved & fine-tuned carefully to avoid any spots or specular highlights on the cup and saucer. We rotated the cup carefully to show it’s interesting shape. In the next shot, the high light from the rim of cup reflecting in the green tea created confusion. To avoid the reflection, we did move the main light source carefully on to our right. Almost closer to the final shot, I suggested my students to get a kind of gentle texture /shadow feel in acrylic base. This of course will break the monotony of the plain white in the base. This had to be achieved without spoiling the feel of high key. The learners were instructed to place a transparent plain glass on the work-table and spread a plain white satin cloth randomly with a graphical pattern and then placed the white acrylic sheet on the satin cloth. The whole set of base was lit from the bottom by a 10 degree grid. 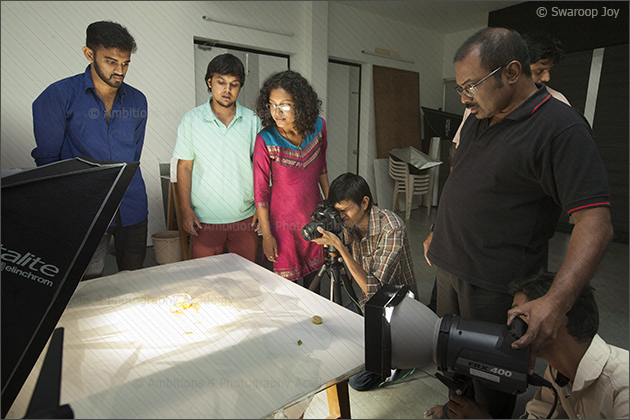 We decided to go for the available light shot using the modeling lamp of the studio flash. This gave us better control of light and shadow on the base of the cup. The camera was tilted a bit to get the dynamic feel. A long exposure of 6 seconds was selected. The camera’s mirror was up and the shot is done by remotely Controlling the camera from the computer. The Elephant is always an animal I wonder and observe. I used to dream about riding on an elephant’s back from my child hood. The day came when I went with our bunch of BTEC level 5 students for a photography tour to Wayanad, Kerala. 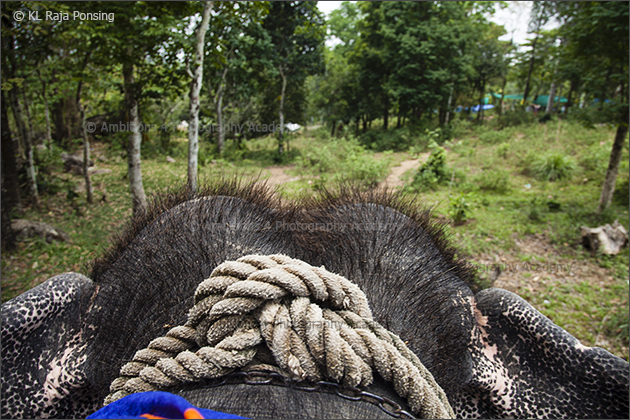 Though I love to be on the elephant’s back, there was an inner fear mixed with excitement when my students insisted me to go for a ride.